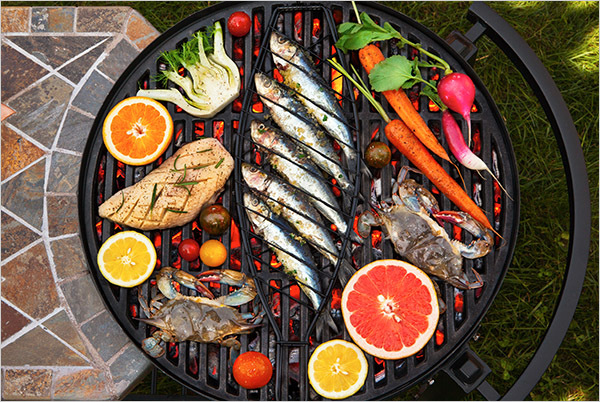 Mark Bittman, the Minimalist columnist for the New York Times, has a great article today: 101 Fast Recipes for Grilling. Bittman has hooked onto a good thing with his 101 recipe series. I don't really need step by step instructions and pictures. I just need some new ideas. I was looking for something to do with the bok choy that came in my CSA share. Hmm. This might work. 8. Lightly char whole or halved heads of baby bok choy; drizzle with soy sauce and top with chopped scallions. I bought a huge package of hangar steak on sale at Fairway yesterday. What can I do with that? 33. Smear hanger, skirt, flatiron or other steak with mustard. Grill and serve with grilled shallots. Awesome. I have a ton of scallions that came with the CSA share. I'll use them instead of the shallots. Is that Finocchio on the grill? I’ve never heard of that. YUM! So many of these ideas sound delish. I especially want to try the grilled Waldorf salad and the pork chops. I have red, orange and yellow peppers at home so am thinking I’ll do those tonight as a side for dinner. Now I’m hungry.